9 negatives : b&w; ; 120 mm. 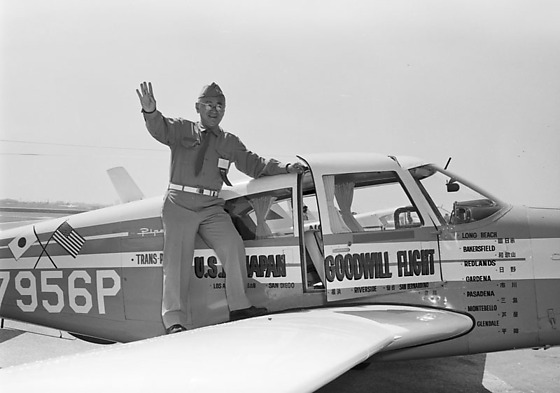 Henry Ohye with Piper airplane on U.S.A.-Japan Goodwill flight, California, ca. 1966. 1P: Woman in black dress placing a tiara on a seated woman in a kimono with upswept hair. 2N: Woman in kimono and tiara sits in a chair in front of a woman in a black dress and three men in suits. Henry Oiye stands at far right in eyeglasses. 3N: Henry Ohye in suit stands on wing of piper airplane, "Henry Oiye" on side. 4N: Henry Ohye in suit stands with proper right arm extended out to the side in front of piper airplane. Two buildings of corrogated steel on either side. Shadow of photographer in foreground. 5N: Young woman in kimono and tiara on bouffant hair stands at far left with five Caucasian men and women outdoors. The men wear suits while one woman wears a hat with her white suit and another wears a fur stole. 6N: Henry Ohye in uniform and shakes hands with another Japanese American man in a dark suit flanked by nine other people on the tarmac next to an airplane, "U.S.A.-Japan". Caucasian girl in Girl Scout uniform stands next to a Japanese American woman at far left. The boys and men wear Boy Scout uniforms. 7N: Henry Ohye in Boy Scout uniform stands next to woman in kimono and tiara on bouffant hair flanked by two little girls in kimono outdoors. Man in suit and dark sunglasses stands behind microphone at far right holding a bottle with ribbon. "Chevron dealer" sign in background. 8N: Henry Ohye in uniform stands on wing of piper airplane waving at viewer. Side door is open. The plane is decorated with American and Japan flags crossed on tail and "U.S.A.-Japan Goodwill Flight" with names of cities in English and Japanese on the side, including Los Angeles, San Diego, Riverside, San Bernadino, Long Beach, Bakersfield, Redlands, Gardena, Pasadena, Montebello, Glendale. 9N: Henry Ohye in uniform with "Los Angeles, 25" on sleeve and official ribbon on pocket stands next to woman in dress holding sunglasses in front of piper airplane described in 8. 10N: Henry Ohye in suit stands next to a young woman in white dress holding an envelope, flanked by ten Caucasian and Japanese men and women in front of airplanes on tarmac. Two Japanese men stand at far left. Two Caucasian women stand at far right. 11N: Henry Ohye in suit receives a certificate from a laughing Caucasian man in plaid suit outdoors. They are flanked by young Japanese woman in white dress and bouffant hair, Caucasian woman and two Caucasian men in suits. 12N: Henry Ohye in uniform, woman in kimono and tiara on bouffant hair, and Caucasian man in shirtsleeves with official ribbon stand on stage outdoors holding a painting of a piper airplane in flight among the clouds. Man in suit and dark sunglasses stands at far right looking at paper behind microphone. 13N: Henry Ohye in uniform stands with four men on tarmac surrounded by marching band in formation. Color guard carries four flags in background, including American and California state flags. Band members are in uniform with plumes on hats. Typed on original envelope: Henry Ohye at Hayakawa Home -- 22736 Juniper St, Torrance California.